Do you need something to get you into the Spring mood? These stand alone butterflies will make you “think Spring.” Any class could make these, if they’re precise with the scissors. The antennae and legs might be a bit difficult for the lower grades. Choose between the already printed butterfly or design your own with the blank version. The directions for, “Butterfly Sparkle,” can be found in the 4th Grade Projects Gallery in the sidebar. 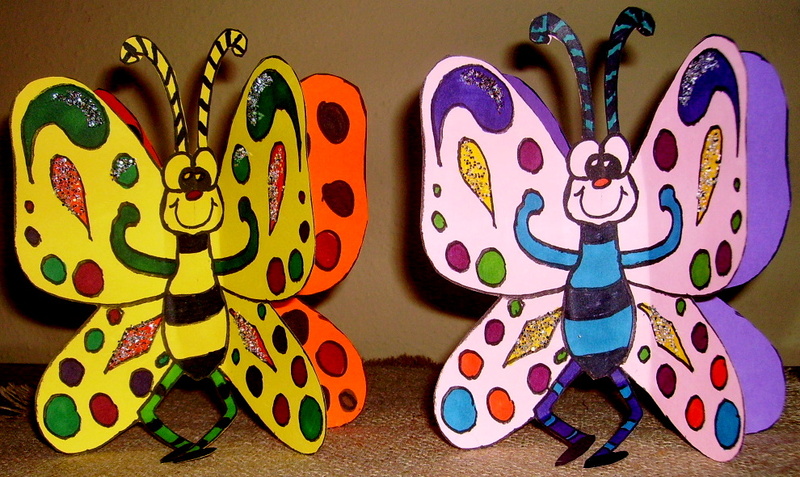 This entry was posted in 4th Grade, Categories and tagged 4th grade, art and crafts for kids, butterfly craft, butterfly craft for kids, butterfly sparkle, craft projects for kids, easy butterfly crafts for kids, paper craft, stand alone butterfly. Bookmark the permalink.